" THREE WISE MEN IN A BOAT "
Their magical golden boat, complete with Moorish-inspired stone arches and a filigreed rudder, sports a “lateen” sail common around the Mediterranean Sea and other Mideast coastal waters. Is this ship floating or has it run aground? Perhaps they are near Bethlehem . . . but it looks a lot like northern Europe. Then again, this journey in a spectacular vessel of imprecise ancestry across a Flemish landscape might just be a jewel of a metaphor for life itself. “These three wise men are taking a shortcut,” says the artist with a twinkle in his eye. is a treasure for your home year round. 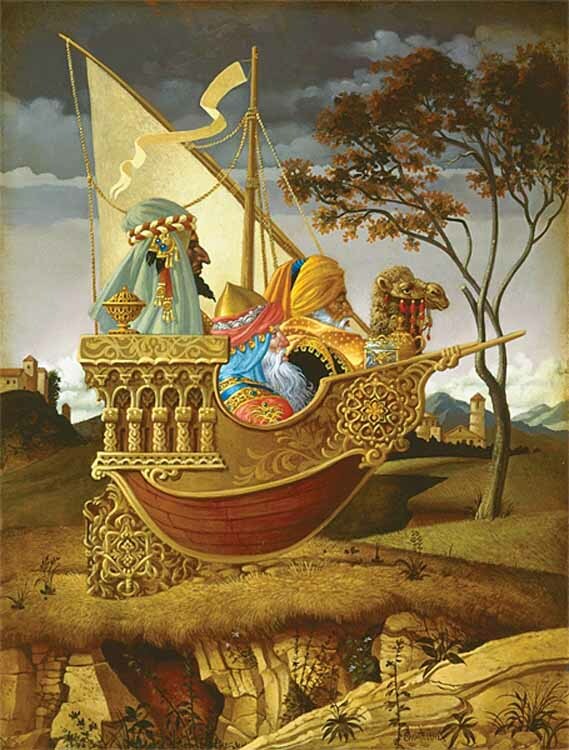 Receive info on new James Christensen releases.